Department of Computer Science Houghton College, Houghton, USA. Received 21 March 2010; revised 28 April 2010; accepted 8 May 2010.
amino acid markers to differentiate the two viruses. evolution can shed new light into the nature of this virus. (HA, NA, M 1 a nd M2) . ments between different viruses to produce a new virus. ditional symptoms such as vomiting and diarrhea . 2009 pandem i c H1N1 HAs w e re quantified [11- 13] . 2009 pandemi c strain  . tion (vRNA→mRNA) in the nucleus of infected cells. in pathogenicity and the induction of cell death [26-28]. the infections caused by the pandemic virus . and 34 markers identified in [44,45], respectively. H1N1 from 2009 seasonal H1N1. and low variance with bagging and randomization. Table 1. Counts of the influenza protein sequences used in the current study. with host adaptation in 2009 pandemic H1N1. tions have the poten tial to contribute to host switches. different co nsensus ami no acids found in step one. 2009 pandemic H1N1, and swine viruses. that were the same at these positions. Random Forests produce non-deterministic outcomes. uncovered with the procedure outlined in Section 2.3.
avian-human and swine-human sites in a single table. cedure to find the novel sites. both. The novel host sites in this protein are the positions without an ‘a’ or a ‘s’ or both. near the right edge of the active site (Table 3). the main target for drug design against influenza virus. position 436 while the other three virus groups had not. tion 127 but the other three virus groups had not. genic sites of N1 (Table 4). the analysis of 2009 pandemic and 2009 seasonal H1N1. mutations into the M gene of influenza virus A/WSN/33. (residues 165-252) that binds to vRNP . replication cycle, viral uncoating and viral maturation. in M2 (L26F, V27A, A30V, A30T, S31N, and G34E). ple-reassortant swine or H5N1 influenza viruses . which was in the extracellular domain (Table 6). Figur e 3 . Top important M1 positions in dis tinguis hing avian , human, 2009 pandemic H1N1, 2009 seasonal H1N1, and swine viruses. Figure 4. Top important M2 positions in distinguishing avian, human, 2009 pandemic H1N1, 2009 seasonal H1N1, and swine viruses. sibility or infection of 2009 pandemic H1N1 . Figure 5. Top important NP positions in distinguishing avian, human, 2009 pandemic H1N1, 2009 seasonal H1N1, and swine viruses. Figure 6. 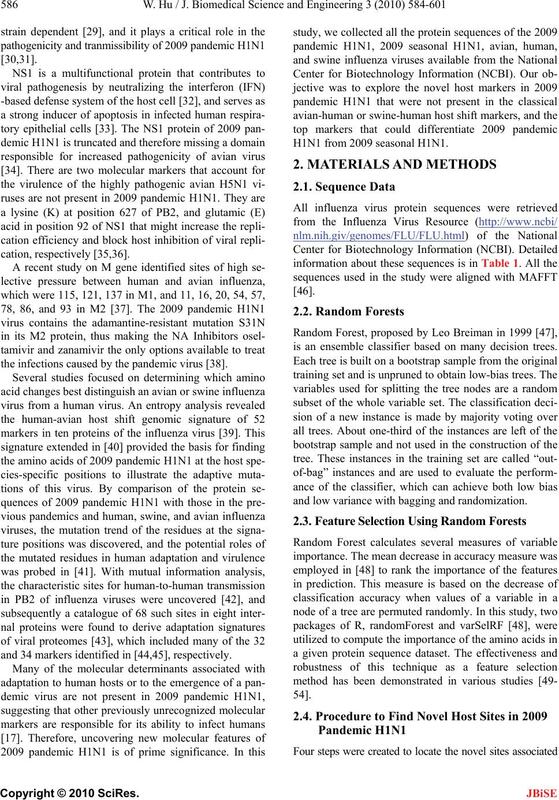 Top important NS1 positions in distinguishing avian, human, 2009 pandemic H1N1, 2009 seasonal H1N1, and swine viruses. in the effector domain (Table 8). site 14 in Table 9 was in this region. within the PB1 binding domain (Table 10). cap RNA cleavage activities [66,67]. dues 600- 7 57 ) (Table 11) . Figure 7. 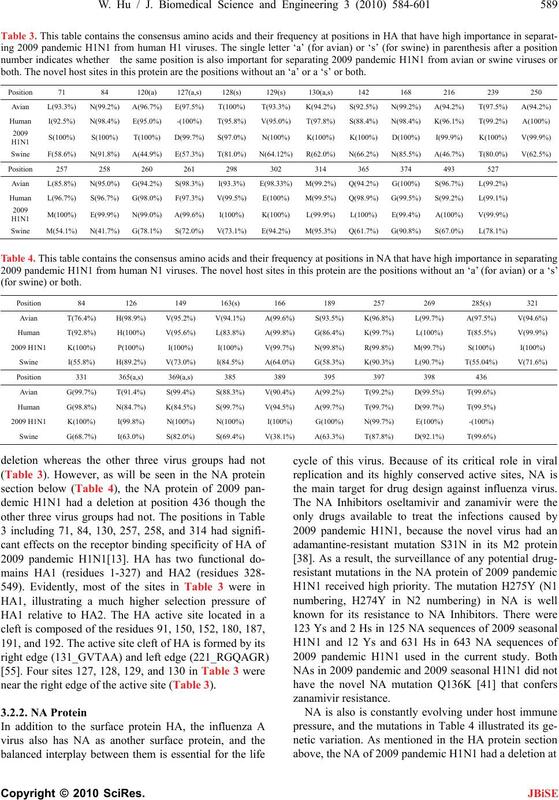 Top important NS2 positions in distinguishing avian, human, 2009 pandemic H1N1, 2009 seasonal H1N1, and swine viruses. Figure 8 . 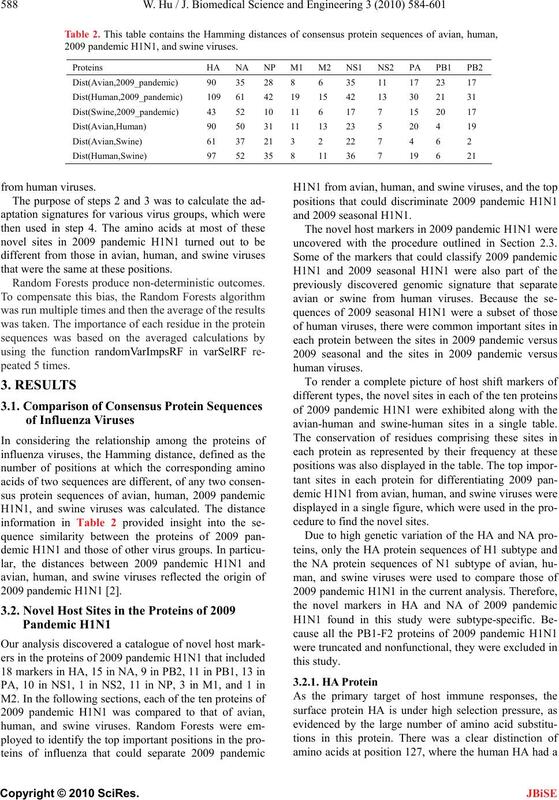 Top important PA positio ns in distinguishing avian, human , 2009 pandemic H1N1, 2009 seasonal H1N1, and swine viruses. and 702 were avian-human host shift markers in . located in the PB2-PB1 and PB2-NP b inding domains . ‘s’ (for swine) or both. Figur e 9 . Top important PB1 pos itions in d istinguis hing avian , human, 2 009 pandemic H1N1, 2009 s easonal H1N 1, and swin e viruses . 590, 645, and 667 in PB2 of 2009 pandemic H1N1. from classical swine viruses in 2009 pandemic H1N1. similar clinical courses but are unique gen etically. Figure 10. 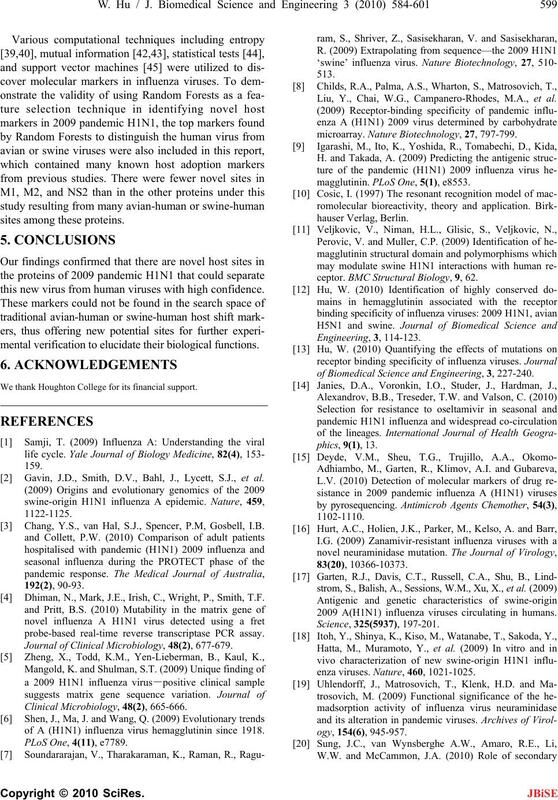 Top important PB2 positions in distinguishing avian, human, 2009 pandemic H1N1, 2009 seasonal H1N1, and swine viruses. this new virus from human viruses with high confidence. mental verificat ion to el ucidate t heir bi ologi cal functi ons. Gavin, J.D., Smith, D.V., Bahl, J., Lycett, S.J., et al. Chang, Y.S., van Hal, S.J., Spencer, P.M, Gosbell, I.B. Dhiman, N., Mark, J.E., Irish, C., Wright, P., Smith, T.F. probe-based real-time reverse transcriptase PCR assay. Journal of Clinical Microbiology, 48(2), 677-679.
of A (H1N1) influenza virus hemagglutinin since 1918. Liu, Y., Chai, W.G., Campanero-Rhodes, M.A., et al. microarray. Nature Biotechnology, 27, 797-799.
magglutinin. PLoS One, 5(1), e8553. ceptor. BMC Structural Biology, 9, 62.
of Biomedical Science and Engineering, 3, 227-240. 2009 A(H1N1) influenza viruses circulating in humans. enza viruses. Nature, 460, 1021-1025.
sialic acid binding sites in influenza N1 neuraminidase. 627E/701N. PLoS Pathog, 5, e1000252. of the United States of America, 106(50), 21312-21316.
nal of Virology, 83 (13), 6673-6680.
prediction. PLoS One, 5(1), e8441. duces cell death. Nature Medicine, 7, 1306-1312.
virus protein. Nature Medici ne, 7, 1286-1288.
pathogenesis. Journal of Virology, 84(1), 558-564.
humans. Journal of Veterinary Science, 10(4), 349-351.
pandemic virus. PLoS Current: Influenza, 21, RRN1006. Journal of General Vi rology, 89, 2359-2376.
epithelial cells. Virology Journal, 7, 51.
kine responses. Nature Medicine, 8, 950-954. Furuse, Y., Suzuki, A., Kamigaki, T. and Oshitani, H.
in different host species: Large-scale sequence analysis. Miotto, O., Heiny, A., Tan, T.W., August, J.T., Brusic, V.
zoonotic strains. PLoS One, 5(2), e9025. viruses. 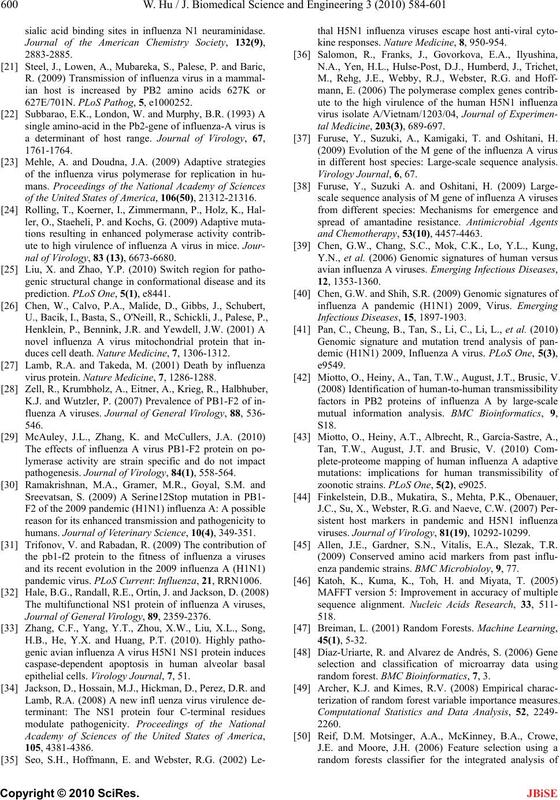 Journal of Virology, 81(19), 10292-10299. Allen, J.E., Gardner, S.N., Vitalis, E.A., Slezak, T.R. enza pandemic strains. BMC Microbioloy, 9, 77.
random forest. BMC Bioinformatics, 7, 3.
terization of random forest variable importance measures. forest algorithm for classification of multi-wa velen gth data. Research in Astronomy and Astrophysics, 9(2), 220-226.
of Biomedical Science and Engineering, 3(1), 59-64.
hemagglutinins. Virus Genes, 24, 57-63.
minidase. Journal of Virology, 67, 2972-2980. Baudin, F., Petit, I., Weissenhorn, W. and Ruigrok, R.W.H. 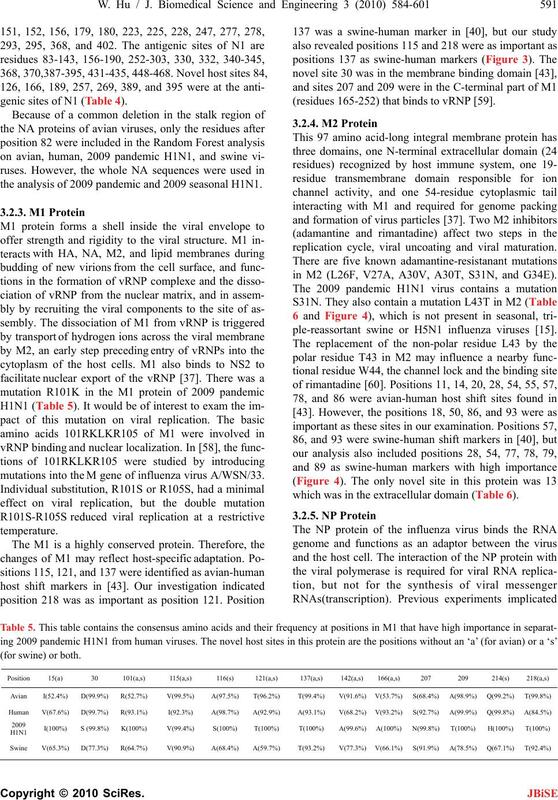 RNP binding activities of influenza virus M1 protein. Dua, Q.S., Wang, S.Q., Huang, R.B. and Chou, K.C. gomers and binds RNA. Nature, 444, 1078-1082.
polymerase proteins. 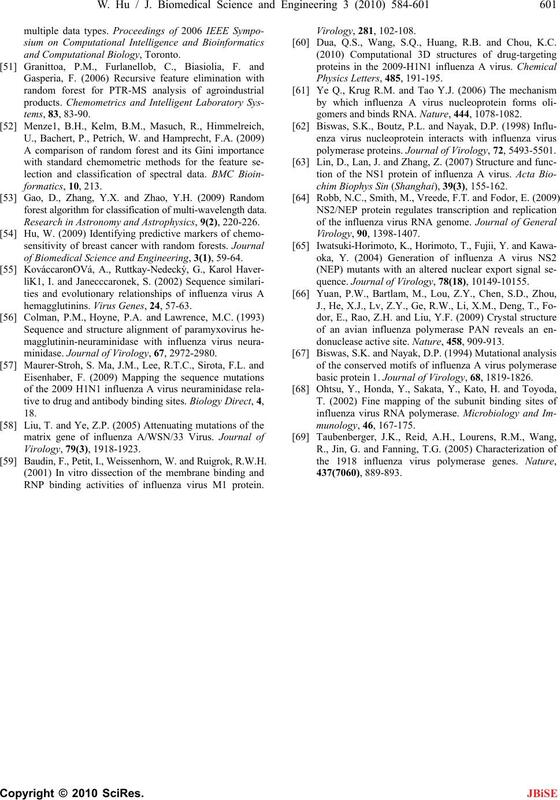 Journal of Virology, 72, 5493-5501.
chim Biophys Sin (Shanghai), 39(3), 155-162.
quence. Journal of Virology, 78(18), 10149-10155.
donuclease active site. Nature, 458, 909-913.
basic protein 1. Journal of Virology, 68, 1819-1826.